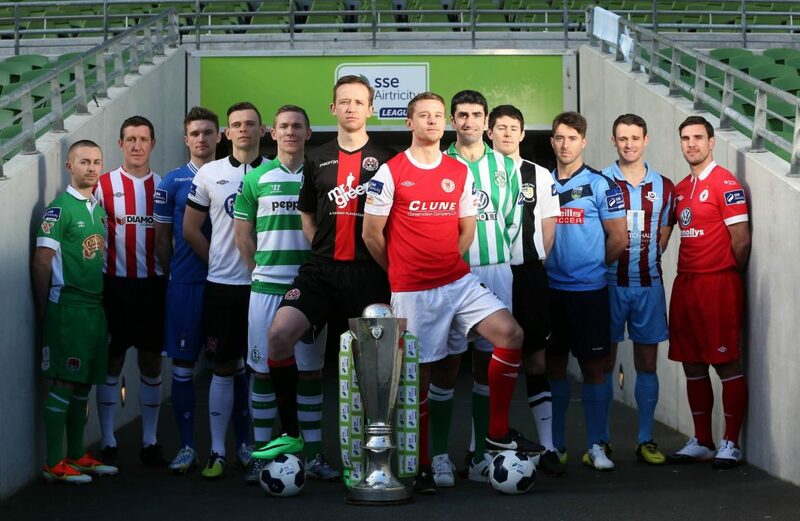 I have mentioned it many times in my column that in my opinion, the SSE Airtricity League is arguably the best in the world. This season has been no exception as the clubs have battled it out in both the Premier League and First Division for the honours. In recent seasons Dundalk have been the leaders and have produced a style of football that is easy on the eye. Stephen Kenny and his squad of players have been a credit to themselves and last season they also had the added bonus of a superb European campaign. Dundalk’s performances have laid down a marker for other clubs to follow and this season Cork have taken up the baton and have certainly put in a monumental challenge for Dundalk’s title. Last season Cork went so close, finishing second to a brilliant Dundalk, in a fact, that Dundalk side is arguably the best team ever to come out of the league. In last season’s campaign, Cork actually beat Dundalk a couple of times and narrowly missed out on the title, but when John Caulfield’s men were triumphant in the FAI Cup Final with a last minute winning goal in extra time you felt the pendulum was about to swing in Cork’s favor. When we went into last weekend’s fixtures Cork sat eighteen points clear at the top of the league, yes you read it correctly, eighteen points. If they wanted to now, they could possibly put out their reserve side for the rest of the season and still win the title. Dundalk is sitting in the second spot and to be perfectly honest, after losing three key players to new clubs they have been absolutely superb to regroup and get winning games again. To lose one player from a title winning side is hard but with three gone the whole dynamic of the squad has changed. Andy Boyle and Daryl Horgan joined Preston and Ronan Finn went to rivals Shamrock Rovers. Stephen Kenny’s men have hit form this season just at the right time with European games only around the corner, maybe just maybe they can repeat their European exploits from last season once again. This season has been no exception as the clubs have battled it out in both the Premier League and First Division for the honours. In recent seasons Dundalk have been the leaders and have produced a style of football that is easy on the eye. Stephen Kenny and his squad of players have been a credit to themselves and last season they also had the added bonus of a superb European campaign. Dundalk’s performances have laid down a marker for other clubs to follow and this season Cork have taken up the baton and have certainly put in a monumental challenge for Dundalk’s title. Last season Cork went so close, finishing second to a brilliant Dundalk, in fact that Dundalk side is arguably the best team ever to come out of the league. In last seasons campaign, Cork actually beat Dundalk a couple of times and narrowly missed out on the title, but when John Caulfield’s men were triumphant in the FAI Cup Final with a last minute winning goal in extra time you felt the pendulum was about to swing in Cork’s favour. When we went into last weekends fixtures Cork sat eighteen points clear at the top of the league, yes you read it correctly, eighteen points. If they wanted to now, they could possibly put out their reserve side for the rest of the season and still win the title. Dundalk are sitting in second spot and to be perfectly honest, after losing three key players to new clubs they have been absolutely superb to regroup and get winning games again. To lose one player from a title winning side is hard but with three gone the whole dynamic of the squad has changed. Andy Boyle and Daryl Horgan joined Preston and Ronan Finn went to rivals Shamrock Rovers. Stephen Kenny,s men have hit form this season just at the right time with European games only around the corner, maybe just maybe they can repeat their European exploits from last season once again. When we went into last weekend’s fixtures Cork sat eighteen points clear at the top of the league, yes you read it correctly, eighteen points. If they wanted to now, they could possibly put out their reserve side for the rest of the season and still win the title. Dundalk is sitting in the second spot and to be perfectly honest, after losing three key players to new clubs they have been absolutely superb to regroup and get winning games again. To lose one player from a title winning side is hard but with three gone the whole dynamic of the squad has changed. Andy Boyle and Daryl Horgan joined Preston and Ronan Finn went to rivals Shamrock Rovers. Stephen Kenny,s men have hit form this season just at the right time with European games only around the corner, maybe just maybe they can repeat their European exploits from last season once again. Stephen Kenny and his squad of players have been a credit to themselves and last season they also had the added bonus of a superb European campaign. Dundalk’s performances have laid down a marker for other clubs to follow and this season Cork have taken up the baton and have certainly put in a monumental challenge for Dundalk,s title. Last season Cork went so close, finishing second to a brilliant Dundalk, in fact, that Dundalk side is arguably the best team ever to come out of the league. In last season’s campaign, Cork actually beat Dundalk a couple of times and narrowly missed out on the title, but when John Caulfield,s men were triumphant in the FAI Cup Final with a last minute winning goal in extra time you felt the pendulum was about to swing in Cork’s favor. When we went into last weekends fixtures Cork sat eighteen points clear at the top of the league, yes you read it correctly, eighteen points. If they wanted to now, they could possibly put out their reserve side for the rest of the season and still win the title. Dundalk are sitting in second spot and to be perfectly honest, after losing three key players to new clubs they have been absolutely superb to regroup and get winning games again. To lose one player from a title winning side is hard but with three gone the whole dynamic of the squad has changed. Andy Boyle and Daryl Horgan joined Preston and Ronan Finn went to rivals Shamrock Rovers. Stephen Kenny,s men have hit form this season just at the right time with European games only around the corner, maybe just maybe they can repeat their European exploits from last season once again. Last weekend Cork faced a tricky trip away to Derry and a point from the game is what was required. So with that in mind, manager John Caulfield must have been delighted that his squad came away from Maginn Park with all three points and had kept themselves clear at the top of the table. The chasing pack is been led by Dundalk and they took Finn Harps apart in Oriel Park, winning by four goals to nil. With such a big gap at the top of the table the story of this season could be developing at the bottom with former champions Saint Patrick’s Athletic and Sligo stuck in real danger of been relegated. I mentioned it earlier in the season that three go down this campaign and unless both clubs get their acts together they could be for the drop. So as we go into the second half of the season it surely is Cork City,s title to throw away. One Cork player who has had a magnificent season is Sean Maguire and he has been signed by Preston, the team that seem to have a great scouting network keeping an eye on all the players in the SSE Airtricity League. Mind you with Simon Grayson now heading off to Sunderland I hope it will not effect those players careers. It is going to take a massive implosion from Cork City now if they are to fail in winning this years title. If and when they do as I fully expect, one man I will be delighted for is their manager John Caulfield, he is already a legend in the city for his exploits as a player and his legendary status will go off the richter status if his team can win the title. It can only be a matter of time now before we crown them champions and let them enjoy a long lap of honour. Before this season kicked off, Division One was always going to be a dead rubber for a lot of clubs unless they were challenging for the one promotion spot. Every team going into this season knew what was on the table and in my opinion it has made a joke of the league and this is certainly something we do not want to hear. At the top it has become a three horse race between Waterford, UCD and Cobh Ramblers and the rest are just scrapping around for points to finish a season that has been over a long time ago now. Next season will be different for a lot of those clubs and I am sure they can not wait to see the back of this one. Waterford who sit top, are only four points ahead of Cobh Ramblers who are in third place and UCD are second, so you can see how tight it is and the run in could be very interesting. Whoever wins the place it will have been a very interesting journey to their achievement of league winners. Stephen Darby: Bradford’s Unsung Hero?